≈ almond and jam dinosaur sandwich cookies. Sift the flour, baking soda, salt, and cinnamon together in a medium bowl; set aside. In the bowl of an electric mixer or in a large mixing bowl, cream together the butter and brown and granulated sugars on medium speed until smooth. Reduce the speed to low and add the eggs and vanilla. Once the eggs and vanilla are incorporated, increase the speed to medium and beat until light in color and fluffy. Reduce the speed to low and add the sifted ingredients; mix until smooth. If using a stand mixer, remove the bowl from the mixer. 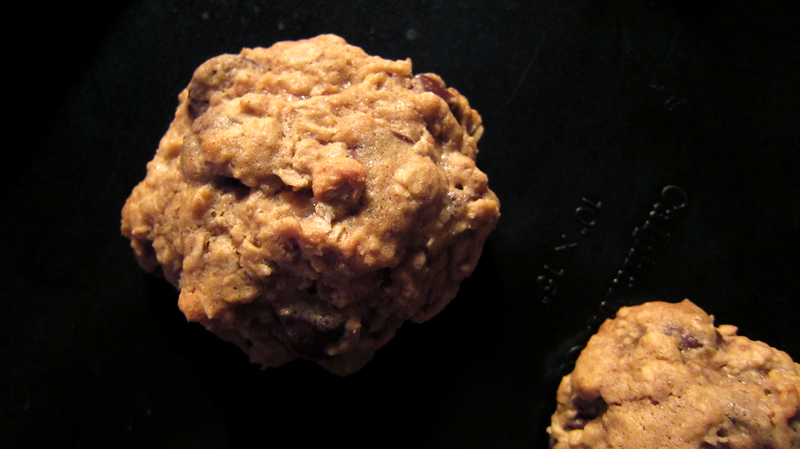 Add the oats and chocolate and, using a wooden spoon, mix the batter until just blended. Cover the bowl and chill in the refrigerator for at least six hours (or chill in the freezer for 30 minutes and then chill in the refrigerator). 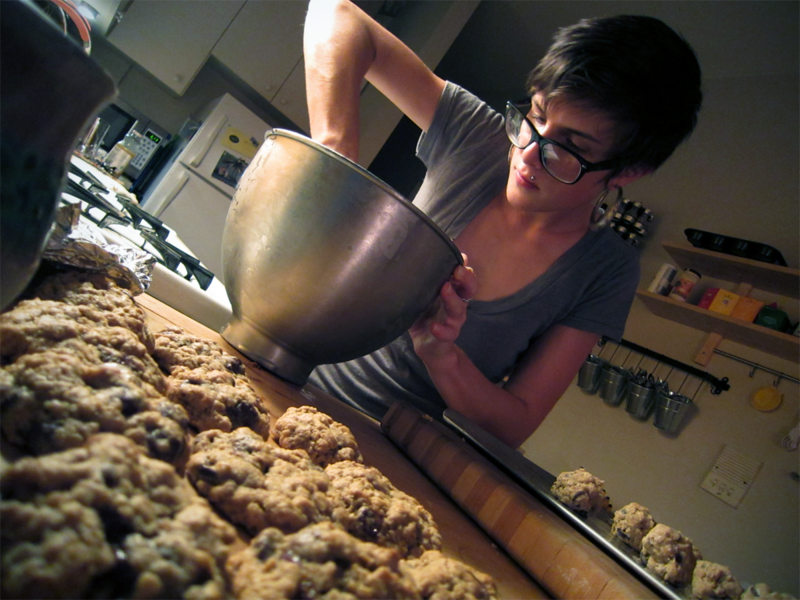 When you’re ready to make the cookies, preheat the oven to 350 degrees Fahrenheit. Drop the dough by large tablespoonsful onto an ungreased baking sheet. Place the baking sheet in the refrigerator for 15 minutes, then place in oven and bake for 13-15 minutes (I would keep it closer to the 13-minute mark, to avoid overcooking). 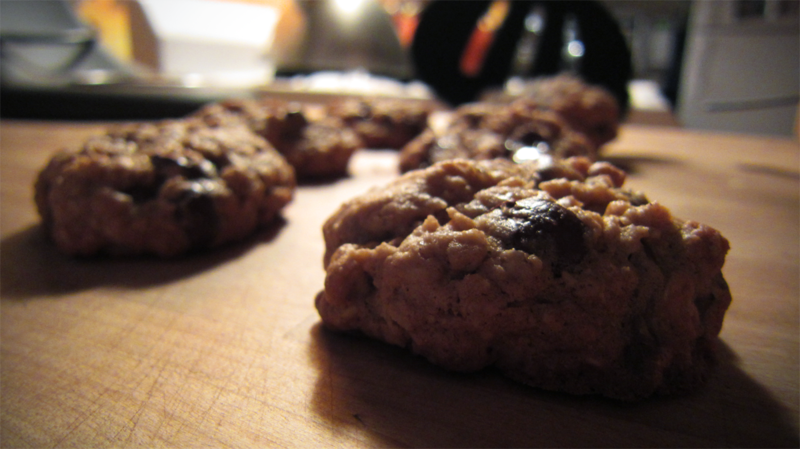 The cookies are done when they are golden brown (darker brown on the edges) and just slightly matte-looking on top. When they are done, remove the cookies from the oven and allow them to cool in the pan for 8 to 10 minutes. After they have cooled, transfer them to a wire rack and allow them to cool completely. Repeat with the rest of the dough. Enjoy with a glass of milk and a smile on your face. photos by the best advice giver in the world, kenan. OMG! I just discovered your blog and love, love, love it! I’m currently in a horribly busy time in my life (not law school, however), so it will take me a while to try your recipes, but they sound divine! Thank you for lovely prose and beautiful photos.